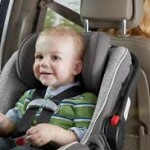 Car Seats: Tips everyone should know! According to Forbes, every 34 seconds, a child under the age of 13 is involved in a crash and more than a third of children killed in crashes were not in car seats or wearing seat belts. Car seats, car restraints, and seat belts are required by law in the state of Wisconsin. Car Seats have an expiration date. Usually 5-6 years from the date it was manufactured unless stated otherwise. Manufactured dates can be found on a label usually on the underside or back of the car seat. Sometimes, do not use after dates are printed into the plastic of the seats. Car seats are only crash tested once. So, if your car seat has been in use during a crash, you should replace the car seat for the safety of your child.